"Amelia Fais Harnas’s day job is translating medical documents from French to English. But by night she retreats to a tiny hillside shed in the backyard of her childhood home in Corning, New York, opens a bottle of wine, and paints with it. Part of her process is consuming while she works, of course, so results are sometimes unexpected—often pleasantly so." Punch Pinterest says she is now based in Portland. 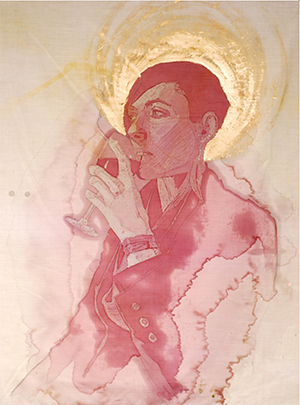 Amelia Fais Harnas began "experimenting with a series of portraits involving wine stains and embroidery" in 2011 according to Christopher Jobson, Colossal. The Huffington Post writes, Amelia "forgoes the traditional canvas and paint for tablecloths and wine." Punch writes about Amelia's process, "Having always loved wine, she recently became curious about how it might work as a stand-in for watercolors. After tirelessly testing the wine painting process (which she prefers to keep partially secret), she has recently started to release them for sale." WSKG Public Media, Artist Cafe, Web Extra, interviews Amelia who explains how this process works. "Amelia Fais Harnas embraces this aspect of wine unreservedly. Her portraits have a shroud like quality about them, haunting whispers of faces that seem as though they may fade away if you stare at them for too long. The inclusion of embroidery, wax resist, gouache and gold ink to anchor and give depth to her designs adds to the sacred feel of the work, replicating techniques used in ancient religious iconography." Amelia has an interesting autobiography and resume worth reading. Her Drunk Politics page is amusing. Official Web Site. Facebook. Pinterest.